PJSC Severalmaz tested unmanned aerial vehicles - a quadcopter and an airplane - for mine surveying of land objects of Lomonosov Mining and Processing Division.Preliminary estimates show that the use of unmanned technologies provides high survey accuracy, increases the speed and safety of work. Geoscan 401 Geodesy quadcopter and Geoscan 101 Geodesy aircraft by Geoscan were used for mine and geodetic surveying.There was test mine surveying of the open-pit mine, dump, ore storages and other bulked land objects.The total area of the survey exceeded 3 km2, and the flight time was 2 hours 40 minutes.To accomplish the assigned tasks, unmanned aerial vehicles flew a total of about 100 km. The processed results of mine surveying showed high survey accuracy.The resulting measurement error is within acceptable limits with a large margin.Besides that, the use of drones made the survey much faster compared to traditional laser scanning (for one of the objects the duration of work was reduced from 115 to 65 minutes), and significantly improved their safety. "Right now, mining companies in our country are only testing the drone-based surveying technology.For Severalmaz, as well as for ALROSA as a whole, this is also the first experience of their use," says Chief Engineer of PJSC Severalmaz Igor Ivanov. "We still need to do an in-depth analysis of the results, but preliminary estimates show that the use of drones for mine and geodetic surveying can be very promising." The unmanned aerial vehicles involved in the tests are designed specifically for mine and geodetic surveying and require no special modification. 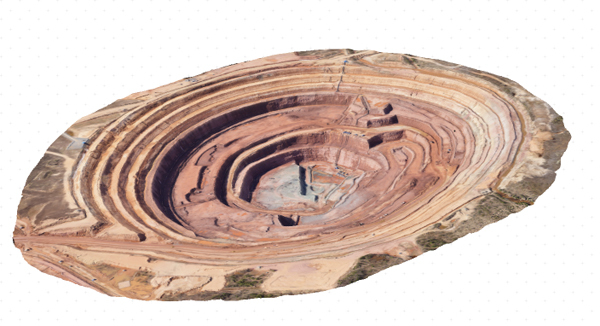 "The use of drones for surveying is one of the components for building the concept of digital production at a mining enterprise.The resulting polygonal digital model of the open-pit mine can be used to automate the processes of calculating the volume of excavated rock mass, comparing the current state of mining operations with the mining project, planning of mining operations, and to solve some other tasks," noted the project director of ALROSA's Strategic Projects and Analytics Center Alexey Tikhonov.